SUMMARY. Patients with psychosis, especially those with specific positive symptoms such as auditory verbal hallucinations, show a source monitoring deficit, the cognitive process involved in the recognition of the information source. This defect can lead to the erroneous conclusion that self-generated thoughts are not “proper” but derive from an external source. We evaluated 37 patients diagnosed with psychotic disorder and 40 healthy controls using a modified version of the Reality Monitoring Task developed by Larøi et al. in 2004. The patients were also evaluated with PANSS, VGF, PSP. We have found that the performance of the Source Monitoring Task differs between patients with hallucinations and controls. According to the literature we can therefore state that patients with hallucinations are characterized by a difficulty in identifying the source of the information they perceive. Our study also adds a new finding to the literature: the source monitoring dysfunction is not due to the presence of current hallucinatory symptomatology but could be considered a stable trait in psychotic patients. KEY WORDS: verbal auditory hallucinations, source monitoring, reality monitoring task. RIASSUNTO. I pazienti con psicosi, specialmente quelli con sintomi positivi specifici come le allucinazioni verbali uditive, mostrano un deficit nel “source monitoring”, il processo cognitivo coinvolto nel riconoscimento della fonte di informazione. Questo difetto può portare alla conclusione erronea che i pensieri auto-generati non sono “appropriati” ma derivano da una fonte esterna. Abbiamo valutato 37 pazienti con diagnosi di disturbo psicotico e 40 controlli sani utilizzando una versione modificata del Reality Monitoring Task sviluppato da Larøi et al. nel 2004. I pazienti sono stati valutati anche con PANSS, VGF, PSP. Abbiamo riscontrato che le prestazioni del Source Monitoring Task dei pazienti con allucinazioni differiscono rispetto ai controlli sani. In accordo con la letteratura possiamo quindi affermare che i pazienti con allucinazioni sono caratterizzati da una difficoltà nell’individuare la fonte delle informazioni che percepiscono. Il nostro studio aggiunge anche una nuova scoperta alla letteratura: la disfunzione del monitoraggio della sorgente delle percezioni non è dovuta alla presenza di una sintomatologia allucinatoria corrente, ma potrebbe essere considerata un tratto stabile nei pazienti psicotici. PAROLE CHIAVE: allucinazioni uditive verbali, source monitoring, reality monitoring task. The term “hallucinations” is described and widely used in current diagnostic manuals as «perception-like experiences that occur without an external stimulus»1. Hallucinations may involve all five senses; however auditory hallucinations are the most common type in schizophrenia and related disorders2. Among auditory hallucinations, verbal hallucinations are of particular relevance in clinical practice. Auditory verbal allucinations (AVHs) consist of the experience of hearing voices in the absence of any speaker3, with a strong affective resonance, determined both by form and content of the hallucinatory experience. As reported in Toh et al.’s revision4, AVHs are found in patients with mood disorders, as well as in non-clinical populations5-8. One of the most successful neurocognitive models of AVHs is the source monitoring (SM) deficit model. SM is the ability to discriminate whether a mental content originates within or outside one own self. According to the SM model, AVHs are the result of a general tendency to externally identify the source of the information facing the conscience9-11. AVH are similar to internal dialogues, but those who experience them lack the ability to recognize them as originating from themselves, an aspect that reflects the more general inability to distinguish between external and internal source of mental objects, between real and imaginary, central in psychotic experience9-13. The SM model is declined in 3 paradigms, based on the type of information to which it is applied; in fact, the subject may find himself having to discriminate between information coming from different sources: external SM; internal SM or SM; Reality Monitoring. The authors specify that these are independent functions: low performance in one of the three areas is not necessarily associated to low performance in the other two10. Most studies show how psychotic patients are characterized by an “externalizing” cognitive style, they attribute the source of thoughts coming from themselves to the outside11,14. The aim of the present study was to evaluate the prevalence of externalizing bias in patients with hallucinations and to correlate the prevalence of such bias with other demographic and clinical variables. 37 consecutive patients admitted to the Psychiatric Unit of “San Salvatore” Hospital during a 13 months period, presenting AVHs were recruited. Inclusion criteria were: diagnosis of psychotic disorder assessed according to Italian version of Diagnostic and Statistical Manual of Mental Disorders, fifth edition (DSM-5) and presence of AVHs (current or in anamnesis). Exclusion criteria for the study were the presence of severe neurological disorders, epilepsy or mental retardation and age over 65, assuming that above this threshold it was difficult to establish the weight of a possible cognitive impairment also determined by the persistence of psychopathology on the tasks of SM. A control group of 40 subjects was recruited for comparison among non-clinical population. We have adopted the same inclusion and exclusion criteria of the experimental group, except for the presence of hallucinations that we propose to investigate in the experimental group. The study was approved by the local university ethic committee and all participants provided written informed consent. The current psychopathological characteristics were assessed using the Positive and Negative Syndrome Scale for Schizophrenia (PANSS)15, administered by trained researchers. The PANSS is a 30-item scale designed to obtain a measure of positive (P), negative (N) and general psychopathology (G) symptoms in patients with schizophrenia. Particularly, we have used the third positive symptoms item (P3) and the twelfth general symptoms item (G12) as indicators of hallucinatory behavior and loss of insight. Global functioning was assessed using the Global Assessment of Functioning (GAF) Scale – from DSM-IV-TR16. This is a clinical test to assess overall functioning level. Impairments in psychological, social and occupational/school functioning are considered, but those related to physical or environmental limitations are not. The scale ranges from 0 to 100; higher scores represent better functioning. Psychosocial functioning was assessed using the Personal and Social Performance (PSP) Scale17. This is a clinical scale that evaluate social and personal functioning. It consist in four areas of social and individual performance as socially useful activities, including work and study; personal and social relationships; self-care; disturbing and aggressive behaviors. Higher scores of PSP represent better personal and social functioning. SM was assessed using the listen-say paradigm, by means of the modified version of the Reality Monitoring Task developed by Larøi et al.18. The administration of the test is divided into two phases. At first the experimenter reads a list of 30 words to the subject, who in turn proposes the first word that comes to his mind for each of them. The words presented vary in terms of emotional salience (10 positive, 10 negative, 10 neutral) and cognitive effort that require. In the second phase, the same words presented by the experimenter in the first phase are presented again (in oral and visual form) together with those generated by the subject (in both cases it is material already known to the patient), along with other new words. 9. the subject disregards the new words by mistakenly assigning them to himself (internal attribution of input distractor; distractor-patient=DP). Differences between patients with and without AVHs in socio-demographical variables were assessed used the t-test or chi-square test as appropriate. Difference in SM variables between cases and controls, as well as between cases with current or past AVHs were assessed using Student t-test. Correlations were performed using the Pearson correlation coefficient in order to highlight the possible association between the internal and external attribution bias and some psychopathological and clinical variables. The agreed statistical significance was p≤.05. D prime for statistically significant differences was measured as recommended by Cohen 19. Statistical analysis was performed using the Statistical Package for the Social Sciences software (SPSS V17; SPSS Inc., Chicago, IL, USA). 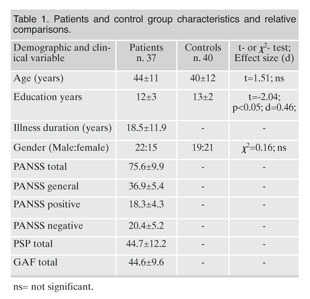 Patients and control group characteristics and relative comparisons are presented in Table 1. Patients and control groups differ for education level but not for gender distribution and average age. 27 patients were affected by schizophrenia, 7 by psychosis nos, 3 by schizoaffective disorder; 24 patients had current hallucinations while 13 patients had past hallucinations. Patients and control groups characteristics are summarized in Table 1. Current and past AVH group, SM results and relative comparisons are presented in Table 2 and Table 3. 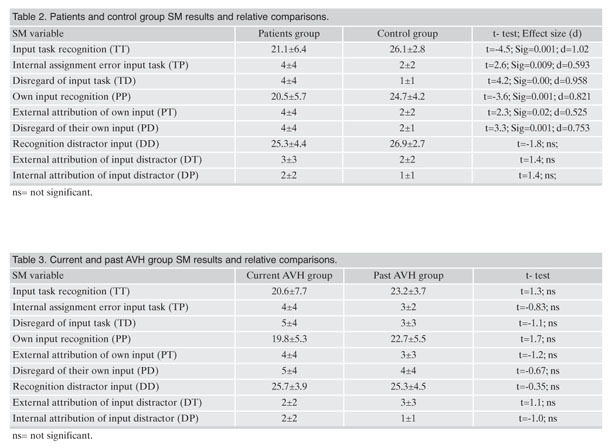 SM results are significantly different between patients and controls for all scores except those related to distractor inputs while no scores differ significantly between current and past AVH groups. A significant difference is shown as regards the effects size, mainly for TT and TD. We correlated the internal and the external attribution bias with some psychopathological variables of the PANSS. The internal attribution bias is not significantly correlated neither to all PANSS scales, nor to the psychosocial functioning assessed with total PSP score, but is positively related to disturbing and aggressive behaviors assessed with PSP subscale (r=0.327, p=0.034). The external attribution bias is not significantly correlated neither to all PANSS scales, but is negatively correlated to PSP total score (r=-0.290, p=0.05) and positively to socially useful activities, including work and study and to self-care assessed with PSP subscales (r=0.324, p=0.036; r=0.351, p=0.022). Additionally, we found a significant positive correlation between duration of illness and the internal attribution errors (r=0.307, p=0.05). The function of Reality Monitoring is the ability to discriminate between self-generated information and information generated by an external source (the experimenter). We aim to compare our results with those of the literature, where an externalizing bias was found in schizophrenic patients with hallucinations compared to non-schizophrenic controls9,20,21 and in patients with hallucinations both to patients without hallucinations18 and to controls22. We propose the study of an overlooked aspect: if the externalizing bias is present both in patients with current hallucinations as in patients with previous hallucinatory experiences. This would allow us to understand if the SM dysfunction is the result of a particular acute psychopathological state, linked to the current hallucinatory symptomatology, or if it can be considered a more stable trait, which reflects a perceptual bias modality of psychotic organization. Our study confirms some elements reported in the literature9,20,21, but also highlights others that are not described. We have found that the performance of the Source Monitoring Task differs between patients with hallucinations and controls. According to the literature we can therefore state that patients with hallucinations (PH) are characterized by a difficulty in identifying the source of the information they perceive. PH show the external attribution bias of the self-generated words (PT and PD) to a greater extent than the controls, similar to what is reported in the literature9. However, our study highlights that patients with hallucinations also have difficulty in recognizing the source of the words generated by the investigator (TT, TP and TD), and that the most widely represented error in the patient group is TT, so the word proposed by experimenter is not recognized as task. We could advance the hypothesis that performance at the Reality Monitoring Task is heavily influenced by cognitive abilities, such as attention and memory, which literature23-26 often describes as impairments in various degrees in psychosis. As the performance of PH and those of controls does not differ as regards the recognition of distracting stimuli (i.e., DD, DT, DP), would make us suppose that the SM dysfunction that characterizes PH is determined more by mnestic functions. These would seem more compromised, preventing recognition of already known words, whose origins are confused, while attentive functions, which would seem more conserved, allowing the recognition of new words (i.e., distracting words). Our study also adds a new finding to the literature: the performance at the Source Monitoring Task differs between PH compared to controls, but they do not differ between patients with current hallucinations and patients with a history of hallucinations. This data would indicate that the SM dysfunction, and the specifically externalizing bias that would characterize patients with misdirections, is not due to the presence of current hallucinatory symptomatology but could be considered a stable trait in psychotic patients 27. In our sample, the SM dysfunction correlates, more than with hallucinatory symptomatology, with more general and pervasive aspects such as psychosocial functioning and years of illness. In conclusion, besides of a desirable expansion of the sample, it emerges the need to include in the experimental design other tools that evaluate the cognitive and neuropsychological functions, in order to clarify if, and to what extent, the aspects may affect the ability to identify the source information. Finally, it would be of considerable interest to replicate those findings of the literature that evaluate the impact of the emotional value of the stimuli proposed and the degree of cognitive commitment required on the performance at the Source Monitoring Task. A better phenomenological analysis of hallucination could help to delineate better treatment option2,28. 1. American Psychiatric Association. Diagnostic and Statistical Manual of Mental Disorders. 5th ed. 2013, Washington, DC: American Psychiatric Association, 2013. 2. Waters F and Fernyhough C. Hallucinations: a systematic review of points of similarity and difference across diagnostic classes. Schizophr Bull 2017; 43: 32-43. 3. Moseley P, Fernyhough C, Ellison A. Auditory verbal hallucinations as atypical inner speech monitoring, and the potential of neurostimulation as a treatment option. Neurosci Biobehav Rev 2013; 37: 2794-805. 4. Toh WL, Thomas N, Rossell SL. Auditory verbal hallucinations in bipolar disorder (BD) and major depressive disorder (MDD): a systematic review. J Affect Disord 2015; 184: 18-28. 5. Pacifico R, Riccardi I, Stratta P, Rossi A. [Psychopathology of verbal auditory hallucinations]. J Psychopathol 2008; 2008: 413-24. 6. Ford JM. Current approaches to studying hallucinations: overcoming barriers to progress. Schizophr Bull 2017; 43: 21-3. 7. Picardi A, Valentini M, Biondi M. [Problems and perspectives in psychiatric diagnosis]. Riv Psichiatr 2018; 53: 61-4. 8. Valentini M, Biondi M, Pasquini M, Picardi A. Dimensional psychopathology of schizophrenia: SVARAD dimensional profiles in an acute inpatient sample. Riv Psichiatr 2018; 53: 40-8. 9. Bentall RP, Baker GA, Havers S. Reality monitoring and psychotic hallucinations. Br J Clin Psychol 1991; 30 (Pt 3): 213-22. 10. Johnson MK, Hashtroudi S, Lindsay DS. Source monitoring. Psychol Bull 1993; 114: 3-28. 11. Woodward TS, Menon M, Whitman JC. Source monitoring biases and auditory hallucinations. Cogn Neuropsychiatry 2007; 12: 477-94. 12. Mazza M, Lucci G, Pacitti F, et al. Could schizophrenic subjects improve their social cognition abilities only with observation and imitation of social situations? Neuropsychol Rehabil 2010; 20: 675-703. 13. Mazza M, Pollice R, Pacitti F, et al. New evidence in theory of mind deficits in subjects with chronic schizophrenia and first episode: correlation with symptoms, neurocognition and social function. Riv Psichiatr 2012; 47: 327-36. 14. Blakemore SJ, Smith J, Steel R, Johnstone CE, Frith CD. The perception of self-produced sensory stimuli in patients with auditory hallucinations and passivity experiences: evidence for a breakdown in self-monitoring. Psychol Med 2000; 30: 1131-9. 15. Kay SR, Fiszbein A, Opler LA. The positive and negative syndrome scale (PANSS) for schizophrenia. Schizophr Bull 1987; 13: 261-76. 16. American Psychiatric Association, Diagnostic and statistical manual of mental disorders. 4th ed., text rev. ed. 2000, Washington, DC: American Psychiatric Association, 2000. 17. Morosini PL, Magliano L, Brambilla L, Ugolini S, Pioli R. Development, reliability and acceptability of a new version of the DSM-IV Social and Occupational Functioning Assessment Scale (SOFAS) to assess routine social functioning. Acta Psychiatr Scand 2000; 101: 323-9. 18. Larøi F, Van der Linden M, Marczewski P. The effects of emotional salience, cognitive effort and meta-cognitive beliefs on a reality monitoring task in hallucination-prone subjects. Br J Clin Psychol 2004; 43: 221-33. 19. Cohen J. Statistical power analysis for the behavioral sciences. London: Routledge, 2013. 20. Vinogradov S, Willis-Shore J, Poole JH, et al. Clinical and neurocognitive aspects of source monitoring errors in schizophrenia. Am J Psychiatry 1997; 154: 1530-7. 21. Baker CA, Morrison AP. Cognitive processes in auditory hallucinations: attributional biases and metacognition. Psychol Med 1998; 28: 1199-208. 22. Morrison AP, Haddock G. Cognitive factors in source monitoring and auditory hallucinations. Psychol Med 1997; 27: 669-79. 23. Rossi R, Zammit S, Button KS, et al. Psychotic experiences and working memory: a population-based study using signal-detection analysis. PLoS One 2016; 11: e0153148. 24. Bucci P, Galderisi S, Mucci A, et al. Premorbid academic and social functioning in patients with schizophrenia and its associations with negative symptoms and cognition. Acta Psychiatr Scand 2018; 138: 253-66. 25. Galderisi S, Rucci P, Kirkpatrick B, et al. Interplay among psychopathologic variables, personal resources, context-related factors, and real-life functioning in individuals with schizophrenia: a network analysis. JAMA Psychiatry 2018; 75: 396-404. 26. Rocca P, Galderisi S, Rossi A, et al. Disorganization and real-world functioning in schizophrenia: results from the multicenter study of the Italian Network for Research on Psychoses. Schizophr Res 2018; 201: 105-12. 27. Stanghellini G, Rossi R. Pheno-phenotypes: a holistic approach to the psychopathology of schizophrenia. Curr Opin Psychiatry 2014; 27: 236-41. 28. Sommer IE, Clos M, Meijering AL, Diederen KM, Eickhoff SB. Resting state functional connectivity in patients with chronic hallucinations. PLoS One 2012; 7: e43516.